As part of Aontas Adult Learners’ Festival, Adult Guidance Services throughout the country were busy holding events to inform people of their educational opportunities. 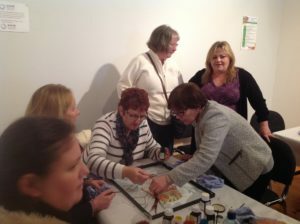 Our Wexford Service held a big event in the Arts Centre, entitled, The Power and Joy of Learning, which attracted over 90 people. The guest speaker on the day gave a motivating presentation on the theory of adult education relating it to the theme of ‘The Power and Joy of Learning’. 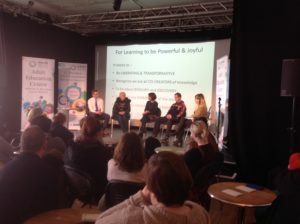 This was followed by a panel interview of four adults who gave testimonials about their journey (1) someone currently doing an insurance apprenticeship with Zurich (2) a ESOL learner who progressed to complete a Business Admin course through VTOS (3) a carpenter who is on a VTOS GAA training programme and (4) an adult who is now in a the 2nd year of a B.A. Arts degree in Waterford Institute of Technology. There were also pop-up workshops where people had the opportunity to decorate cupcakes, contribute to an art piece using glass paints and there were exhibits from groups who have completed mosaic work and puppet-making. Positive feedback showed people gained a new perspective on the Power and Joy of Learning and it also worked well to bring greater awareness of supports offered through the Co. Wexford Adult Educational Guidance Service.